0 Look at the top card of your library. You may reveal that card. If an instant or sorcery card is revealed this way, transform Delver of Secrets. +2 Put the top card of your library into your graveyard. If it’s an instant or sorcery card, put a loyalty counter on Aberrant Researcher. -4 Create a 1/1 blue Human Wizard creature token. 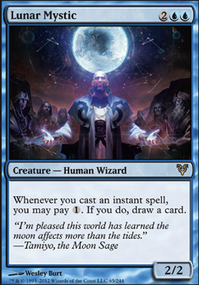 Until the beginning of your next turn, whenever you cast an instant or sorcery spell, create a 1/1 blue Human Wizard creature token. -5 You get an emblem with “Wizards you control get +2/+1 and have flying." I cheated a bit, stapling on abilities based on Aberrant Researcher Flip and Docent of Perfection Flip. +3: Up to one target artifact becomes an artifact creature with power and toughness equal to its converted mana cost. -4: Exile target permanent with one or more colors. -9: Return all artifacts from your graveyard to the battlefield. Transform ~. Spells your opponents cast that are one or more colors cost more to cast. I based this one on the cards TypicalTimmy and Saturnity made up above in Post #'s 20 & 21. Karn sacrifices himself for the greater good, leaving behind a "legacy" that will be felt for years to come. Seems very Karn-like, actually, from what I know about him. New challenge: Let's "evolve" a cool creature, the way Delver of Secrets Flip "turns into" Aberrant Researcher Flip and then that other one, forgetting the name right now. Let's evolve Vampire Nighthawk. Make a "bigger" version of him, please. 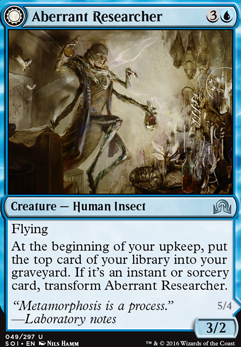 Aberrant Researcher Flip - There are better options to throw cards into your own graveyard. 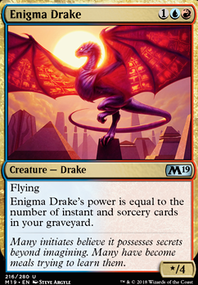 Examples include Sultai Ascendancy or Search for azcanta which will later let you Anticipate each turn. Accursed Witch Flip - Curses alienate one player and make them hate you. You don't want people to hate you in EDH. Also curses aren't very good to begin with. Ashling, the Extinguisher - 4 mana with no evasion makes it very unlikely this critter will actually connect with players. I recommend cutting it for a better force-sacrifice effect like Innocent Blood. Bloodbriar - It's selfish (it only gives itself +1/+1 counters) and it has zero evasion. Not worth it. I recommend Reyhan, Last of the Abzan in its stead; it has the same CMC and lets you move around +1/+1 counters all day. Briarbridge Patrol - Not very good. Tireless Tracker is so much better. Replace the creature-searching with Evolutionary Leap or if you want to spend $75 Survival of the Fittest is amazing. Centaur Rootcaster - Same reason as Ashling. Get rid of it. Wood Elves and Sakura-Tribe Elder instead. Deadeye Plunderers - You only have two artifacts in the deck. Demon of Wailing Agonies - Slow. Especially when your commander has CMC 6. Gatekeeper of Malakir - BBB cost is really hard to get sometimes in BUG colors. Glissa, the Traitor - Slow. She's neat and a good blocker but it doesn't matter because you only have two artifacts. Greater Harvester - Same reason as the Gatekeeper. Run Smothering Abomination instead. Labyrinth Guardian - This critter adds nothing to your strategy. Magus of the Mirror - I've killed people with their own Magus. Also the same problem as the curses; it alienates one person. Also Tree of Perdition exists. Marrow Chomper - Too slow. Mortician Beetle - Selfish. Swap with Fleshbag Marauder and Slum Reaper. Patron of the Nezumi - Not enough rats to make it worth it. Effect is meh. Phylactery Lich - Same reason as Gatekeeper. Also you only have two artifacts. 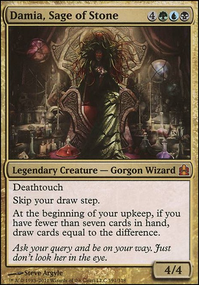 Savra, Queen of the Golgari - She does nothing on her own; she needs other things to do her work which isn't good. 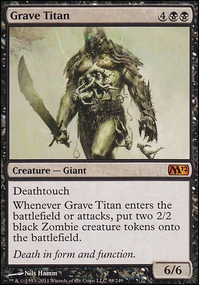 Sidisi, Brood Tyrant - Just run Grave Titan instead. Skullmulcher - Consider Soul of the Harvest instead. Both are good but you might need more gas than Skullmulcher can give you. Utopia Mycon - Too slow. I'll add more comments when I get more time to look over the next few categories. 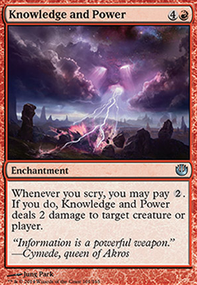 yetiz, if I were picking replacements I would probably grab Thought Courier over Augur of Bolas. The reason being that Augur of Bolas only grabs instants and sorceries while Thought Courier offers more filter. Another option would be Runechanter's Pike. The reason that Aberrant Researcher Flip is still there is largely lore based. would Augur of Bolas make a good replacement for Aberrant Researcher Flip? Thanks TrueTribal for the suggestions! Went ahead and added the suggestions, took out Aberrant Researcher Flip because it wasnt holding its own weight. 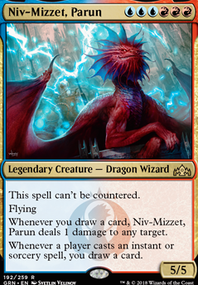 chadsansing on Izzet of the guilds? Cool commander and theme - nice list!